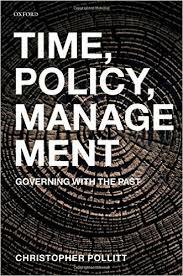 POLLITT Christopher (2008), Time, Policy, Management. Governing with the Past, Oxford University Press. “One big issue, I think, is how do we create the frameworks, procedures and incentives which will oblige our executive politicians to pay more attention to fantastically important longer term issues (e,g. climate change, technological change, demographic change) and less to what will appear on this evening’s TV news.” – Christopher Pollitt.